Tiny Review is an iPhone app that gives you a quick way to look around. Tiny Review, recently put out by Beeem, Inc. falls into the increasingly popular category of social networking local discovery apps. 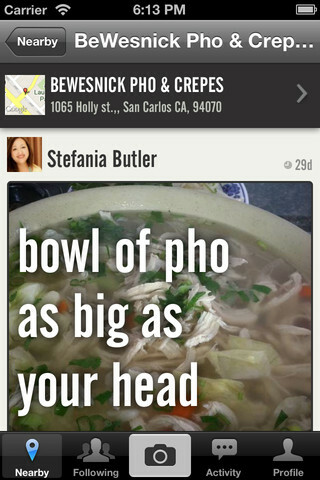 Unlike bigger, better known social networking apps, Tiny Review has yet to attract much of a following. As a result, there are few reviews of anything; thus far. On the other hand, it is easy to see just how this kind of app will attract attention. One of the chief complaints I have about other social networking review apps is the fact that entering information is time consuming. Additionally, there is the fact that accessing reviews takes just as long and if you are working with an iPod Touch or the iPhone app , scrolling around gets awkward. Tiny Review is much simpler. One picture, three small lines of text and you are done. The picture is perhaps one of the nicest features. It takes the stage, front and center, allowing the reviewer an opportunity to share a favorite view, entrée or anything else for that matter. The pictures are easy to see and large enough not to leave any questions as to what is being viewed, even on an iPod touch . On the negative side, however, the application seems to have some serious issues when it comes to estimating mileage. Reviews listed nearby were off by over 100 miles, making it potentially difficult for someone unfamiliar with the area to properly judge location. Another flaw is that there is no way to use the application directly in conjunction with the built in map function found on Apple devices, so getting directions is a multi step process. Since many entries lack an address of any kind narrowing down the exact location is a hit or miss proposition. As an iPhone app Tiny Review certainly has potential, although it might not be as useful on the iPad . Being able to access reviews of nearby restaurants or other facilities on the go is always handy. Thus far, though, many of the entries in the data base have nothing to do with actually appraising a specific venue, rather they are comments about an experience, and as entertaining as that might be, it isn’t actually helpful. It is easy to see the appeal of Tiny Review; it has visual impact and it only takes a few seconds to use. As more users get on board and increase the available database the number of reviews in any particular area should grow, offering a better selection of appraisals. Assuming the mileage issue is corrected, Tiny Review has a great deal of potential. 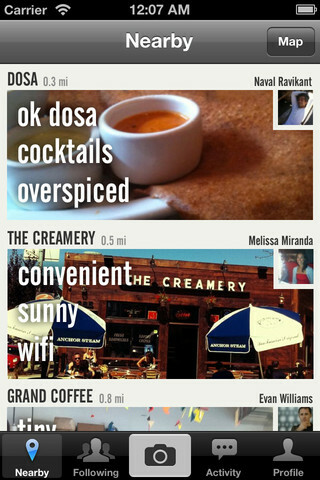 AppSafari review of Tiny Review was written by Darius Reimm on November 15th, 2011 and categorized under App Store, Food, Free, Local, Social. Page viewed 4843 times, 2 so far today. Need help on using these apps? Please read the Help Page. How do you post the pic in FB?